Visitors look around the list of Nobel laureates in literature. One of the new highlights of the Paju BookSori Festival, to be held from Sept. 15-23, is the introduction of the Paju Book Award, according to the organizers . The organizers said that the award was the first of its kind that honors unique achievements of Asians in the field. The ceremony will be held on Sept. 17. The nine-day festival will offer a diverse range of programs for book lovers, publishers and authors. The programs include meetings with authors, book readings, performances, exhibitions, workshops and seminars, among others. It also features a lecture series with 30 guest authors. Visitors are also allowed to visit printing shops and publishers in the complex to observe the book-making process. A collection of ancient documents will be on display as well. Located 30 kilometers north of Seoul, Paju in Gyeonggi Province has recently emerged as the nation’s new center of art and culture since the establishment of Paju Book City in 2005. It seems that in the festival’s inaugural year in 2011, it was received with enthusiasm from visitors here and abroad.This year, the festival will have more than 200 publishers and 300 cultural organizations are participating from within and outside Korea. 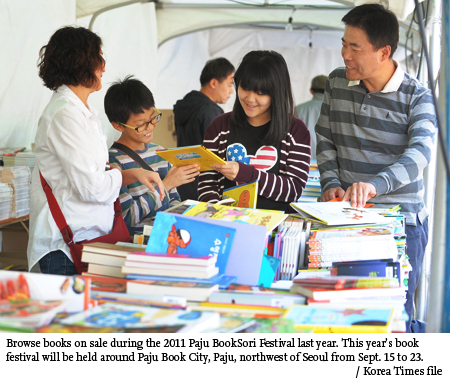 For book lovers, there will be a book market, where visitors can buy books at discount prices. There will be books from Europe and Japan that were not previously available in Korea. 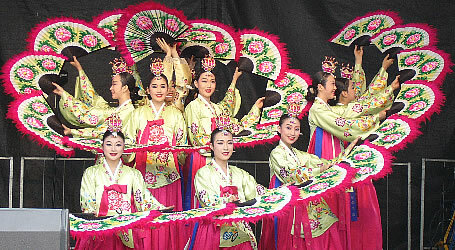 Highlights of the festival include activities to mark some of Korea’s greatest scholars and writers. Those recognized include Jeong Yak-yong (1762-1836, styled Dasan), a leading Korean philosopher from the late Joseon Kingdom. A special exhibition of Korean magazines since the Japanese occupation will be prepared by the National Museum of Korea and a symposium of the world’s book towns from Belgium, Norway, Australia, Malaysia and Japan. There will be a special exhibition on the development of Hangeul, the Korean alphabet since its creation in 1443. Combined with great scenery and restaurants, Paju Book City is the perfect getaway for weekenders any time of the year as one of the most successful culture communities in the nation. Paju Book City was conceived 22 years ago but only completed in 2005. In the early days, it was criticized for poor accessibility from Seoul and other major cities, but six years on most of the publishing companies doing business in the complex have expressed a high level of satisfaction. In addition to publishing companies, the Paju Book City houses printers, book-binders, and cover design companies. For more information on the festival, visit www.pajubooksori.com.